Sento’s rather fantastical story regarding the park and its inhabitants isn’t the only surprise in store: Kanie’s about to meet those attempting to shut the place down. Not Enough of a Boost! As Kanie continues to create change throughout the park, Sento feels as though she isn’t helping enough. However, as a storm threatens to flood the park, Sento takes charge! Kanie’s new ticket prices are having a not-so-surprising backlash - the park’s broke. Desperate, he, Sento, and a few of the mascots head to a cave rumored to hide treasure. With the park beginning to prosper, Kanie and Sento begin to interview for more staff, but Sento is a little… on edge about it. 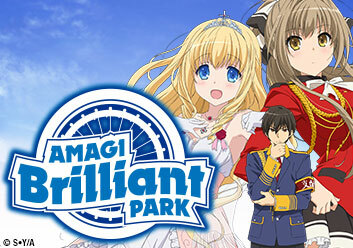 With summer in full swing, Amagi’s water park is open. However, the shark mascot, Jaw discovers something fishy in the machine room, and danger may be lurking in the waves! The Elementario fairies are a little frazzled as they attempt to work on a new show, and they just can’t work together! Will they finally be able to become a team? The visitor count steadily escalates following the grand opening of the park’s night time operations. Later, Kanie discovers the grave consequence should he fail in his task. Nothing to Worry About Now! After finding out Latifah’s reliance on the park, Kanie doubles his efforts into making sure they reach their target visitor count in time. Will it be enough? Nobody Knows What the Future Holds! OVA: No Time to Take It Easy!